Loved it. Best in the series, hands down. It is an emotional read, but I think some of the reviews (on here and on other boards) are over doing it a bit when reviewing the first part. I think its scaring some fans away! Truth is it is an emotional, bitter-sweet tortured hero story with an HEA. It's a captivating, enthralling, and non-stop page turning read. It is also funny and heart warming with some surprising twists that will make dark-hunter fans cheer! I think JR Wards books are equal in the emotional angst and tortured hero storyline, so dark-hunter fans should not hold off for fear of getting too emotional. 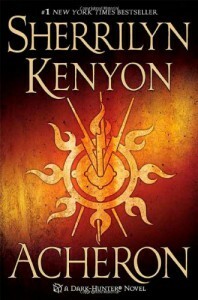 Its an amazing survival story, and it truly is Kenyon's best piece of work. I loved how she used first-person writing in several of the chapters, it really added so much. And the world building remained solid and true to what we learned it all her other books, but it was great to read the history of Acheron and the dark-hunters all in one book. (instead of bits and pieces in all of her other books.) Ash's heroine was great, and this romance felt much more believable than many of Kenyon's recent books. This book will be a hard act for Kenyon to follow, but I am so glad to have it.